It should be no surprise by now that Internet marketing is influencing your business. Even if you don’t have a website or social media presence, the Internet is impacting you directly. You could argue that you’re not “on” the Internet. However, if that’s the case, you’re passively empowering your competitors, which does nothing to mitigate the impact. Assuming you want to grow your business, and you do have a website and social media presence, the question often comes up about what to work on first and how much effort to put into it. 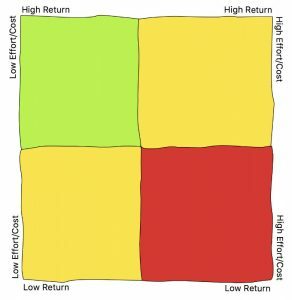 One tool I find useful is something I like to call the decision making matrix. I didn’t make it up, but I can’t remember where I first encountered it. If you know a better name, I’m all ears. As you can see, there are four boxes with labels indicating a sort of ratio between the effort and/or cost and what you can expect in return for that effort. Essentially, it’s a simple cost/benefit analysis you apply to a given tactic, represented as a position on the grid. The goal is to prioritize things you can accomplish quickly that produce the highest return. Those items would be placed in the upper left green box. Their position within that box should be determined by degree. 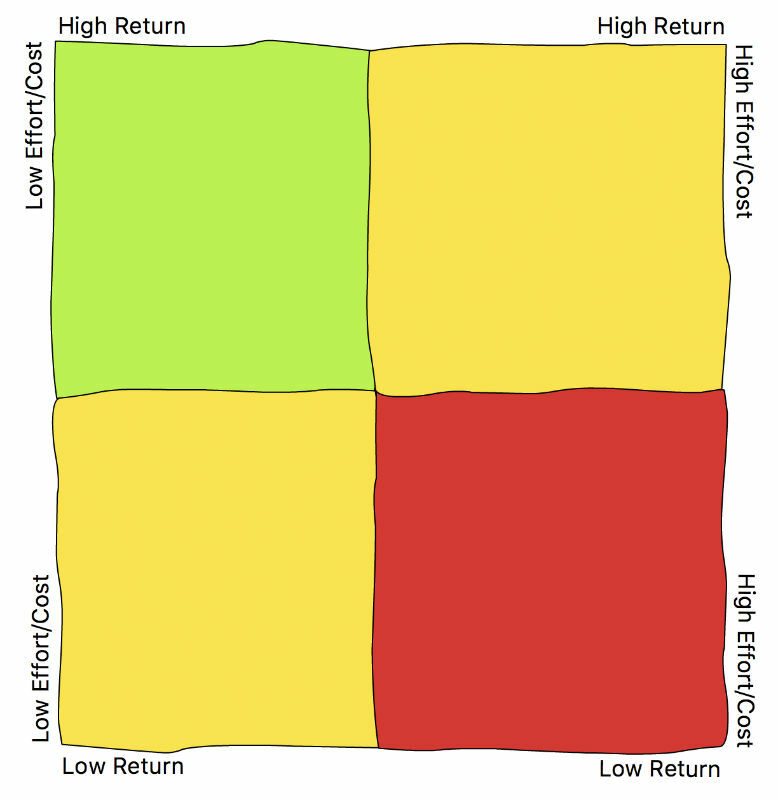 The easiest/cheapest items with the greatest anticipated outcome are placed closest to the upper left corner. Those should be accomplished first. 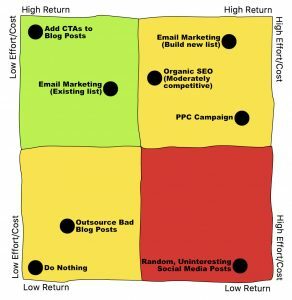 Here’s an example of the decision matrix populated with high-level digital marketing activities. Keep in mind, very little thought went into selecting these tasks. In the real world, you’ll want to assess available resources and the current state of your marketing efforts and competitive position. In truth, I’ll rarely create a matrix that’s this broad. At this level, I will have already established marketing milestones for these types of tasks. For example, I might evaluate a dozen or more back-linking opportunities and use the matrix to decide the order and timeline by which to tackle them. The point is to keep focused on activities that will yield the greatest benefit, prioritizing simple ones first. Establish a timeline to deal with more difficult or costly strategies, and avoid wasting time and money on High Effort/Low Return tactics altogether. Most marketers and business people in general set priorities based on instinct, or what happens to be hot potato at any given time. Many times, I’ve watched decision-makers throw good many after bad, or spend countless hours working on High Effort/Low Return activities. Meanwhile, easy tasks with a high potential return have gone ignored. It is easy to fall victim of tunnel vision when you are in the middle of something that only seems important. Using this or most any other tool to apply some “science” to your planning should help you to act rather that re-act. Almost always what’s best for your business will be the things you can do quickly that make an impact. Many times, even low return items that can be accomplished quickly and easily will take priority over high return items that require lots of effort and/or tie up resources. The key is to make continuous incremental gains, and those seemingly minor activities can have a major impact over time.